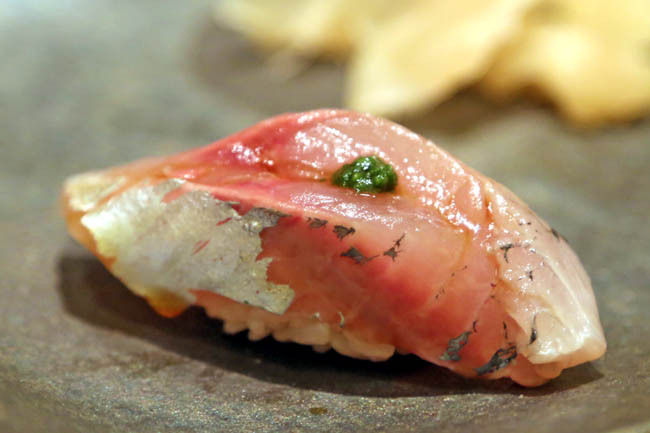 Tucked away at the iconic Raffles Hotel, Shinji by 2 Michelin-starred Chef Shinji Kanesaka is an Edo-style sushi restaurant, serving sashimi and sushi at the most superior quality at an intimate setting. The highest tier is the Omakase Shin ($450) which includes appetiser, assorted premium sashimi, assorted cooked dishes, sushi, soup and Japanese fruit. 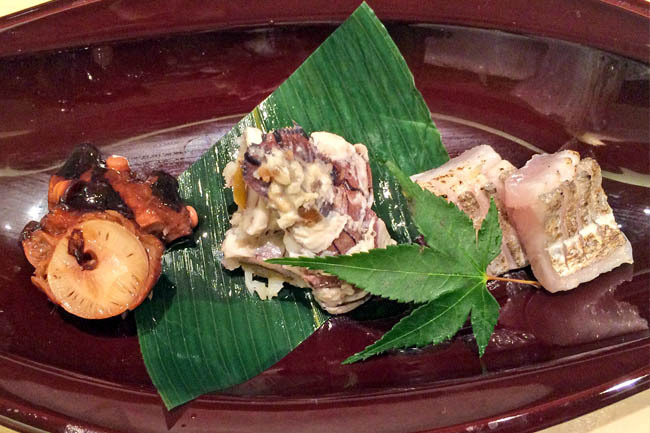 The next level Omakase Wa ($300) serves ‘normal’ sashimi without the ‘premium’. 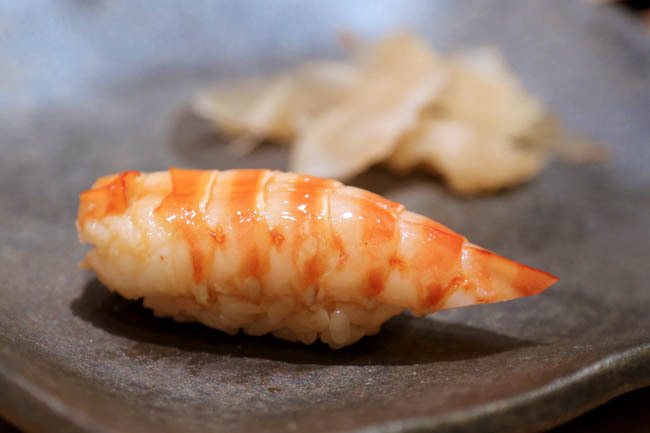 If splurging is an issue, there is an Edomae Sushi set ($220) comes with 15 pieces of nigiri. A friend of mine goes regularly for their Hana Lunch Set ($75), which she claims those 9 pieces of happiness bring her to heaven all the time. I specially requested for Master Chef Koichiro Oshino, who crafted his sushi art from Ginza to Yamazato in Amsterdam. He greets with an impeccable smile, moves in swift rhythms, and is intently serious at work. 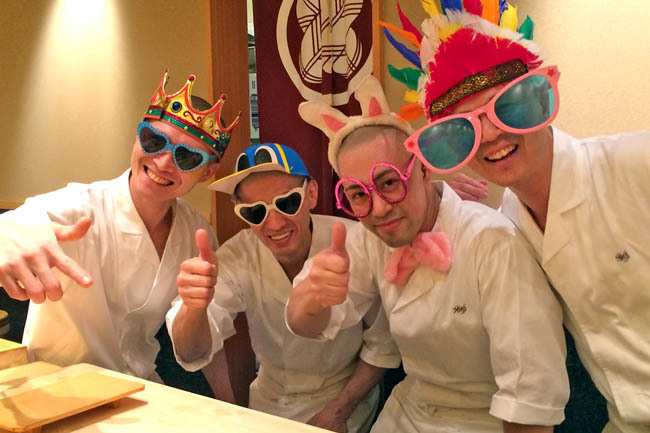 All the sushi chefs have shaved heads, no chains, no rings, no watches, symbolising that the restaurant is pure and clean. 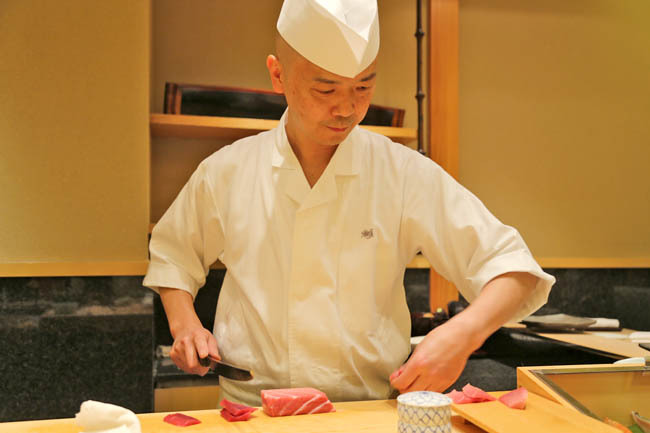 After watching Jiro Dreams of Sushi, you would realise that customers are in awe, respect yet fear the sushi masters all at the same time. I initially had some of that fear, but Chef Oshino was usually smiley during his momentarily breaks, humorous as he does his explanation in the most candid manner. There was a birthday celebration, and the chefs broke up in song and less of a dance. 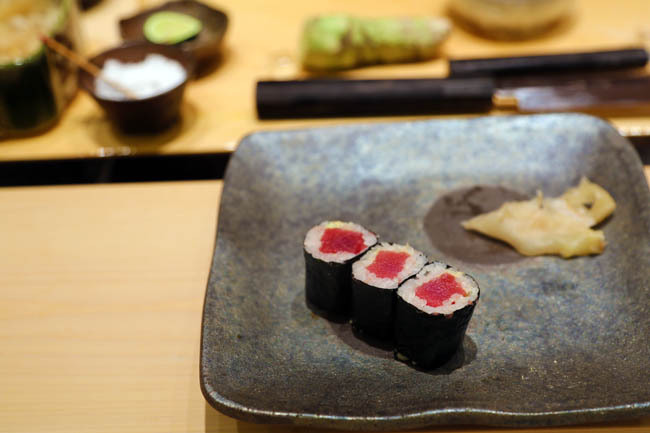 Needless to say, the sushi is world-class, especially its tuna. 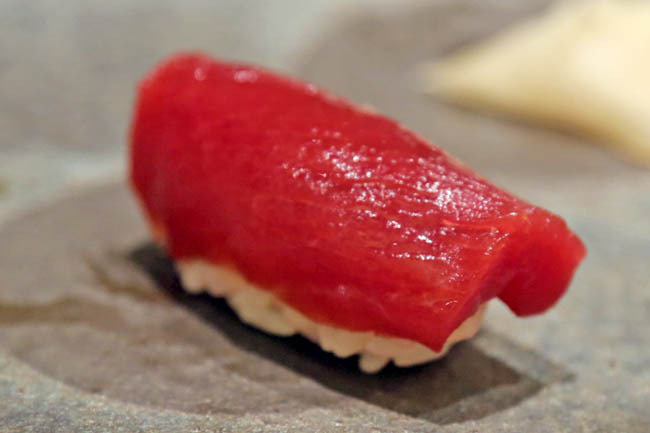 The pinkish Chutoro (medium fatty tuna) was so fresh it can literally slide down the throat, Otoro (tuna belly) rich creamy with amazing sirloin feel, and Akami (red meat) where you could almost feel the tuna evaporating in your mouth. Dessert was a slice of honeydew, one of those premium Japanese fruits which cost a 3-figure sum in a supermarket that I never got to courage to luxuriate. The slice was so unadulterated sweet it was truly amazing. The dining experience was unfortunately marred by less-than-considerate customers. 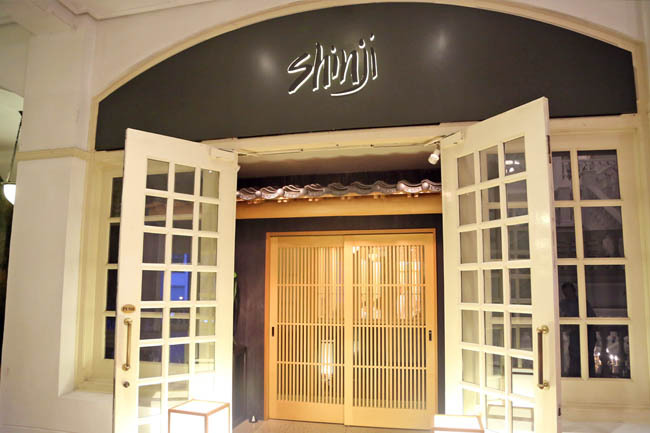 A couple was name-dropping and boasting about recent purchases at the top of their voices (Shinji is an imitate sushi bar so you can hear everything), another kept asking for wasabi top-ups, while one asked if the salmon could be cooked. Chef Oshino dealt with most such requests with a polite laugh. Impressed. 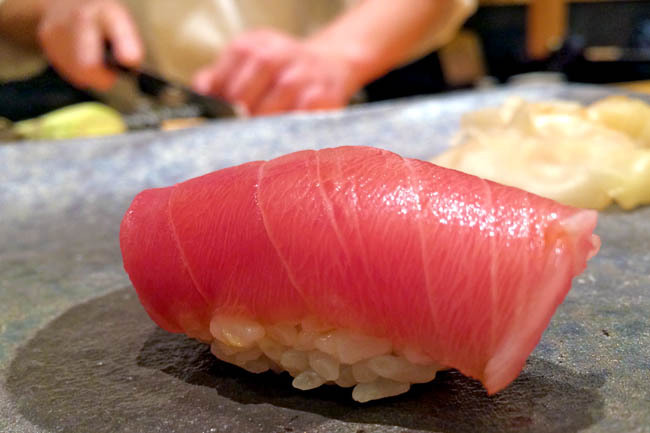 Watching the skilled Japanese chefs at work feels like an art, orchestra, and performance at the same time. Shinji by Kanesaka is indeed one of the best, and as customers, we have to learn to respect their craft as well. Raffles Hotel #02-20 1 Beach Road (via Seah Street lobby) Singapore 189673.